Last month, we proudly announced that Tenjin has officially been named a Snapchat Mobile Measurement Partner! Our users are now able to attribute Snap installs and use Tenjin to calculate ROI & LTV for all Snap-acquired users. Furthermore, this means UA managers in Tenjin can now see even greater returns from their Snapchat user acquisition efforts. By combining aspects of the Tenjin growth infrastructure with the powerful targeting tools made available by Snap, app marketers can start executing any number of sophisticated digital marketing strategies that can put them ahead of the competition. First, create a cohort of paying users and fetch a list of their advertising device IDs from DataVault, Tenjin’s proprietary data warehousing solution that all developer package customers have access to. Next, upload this list of advertising device ID’s into Snap Audience Match (SAM). Using these IDs, Snap will automatically match users from your list with Snap users, producing a list of known-paying users that can be used in your Snap campaign targeting! Keep in mind that these lists can be used both for inclusion and suppression, allowing for more efficient targeting when it comes to filtering out users that don’t exhibit desired behaviors in IAP conversions or ad engagement. Be sure to play around with this, as there are limitless combinations of user segments! Another way to scale your Snapchat efforts with Tenjin is through Lookalike Audiences (LAL), which allow marketers to extend their targeting to include Snapchat users with similar characteristics to any matched segment of users, including those identified through lists of advertising IDs. We hear from many UA managers that this one of the most efficient ways to target right users on Snapchat. Like audience matching, the process is pretty straightforward and involves pulling IDs from DataVault, matching the audience in Snapchat, and then choosing a country for targeting lookalikes. From there, it’s just a choosing a lookalike type: either Similarity, Balance, or Reach. This is especially useful when using a segment of your most engaged users. 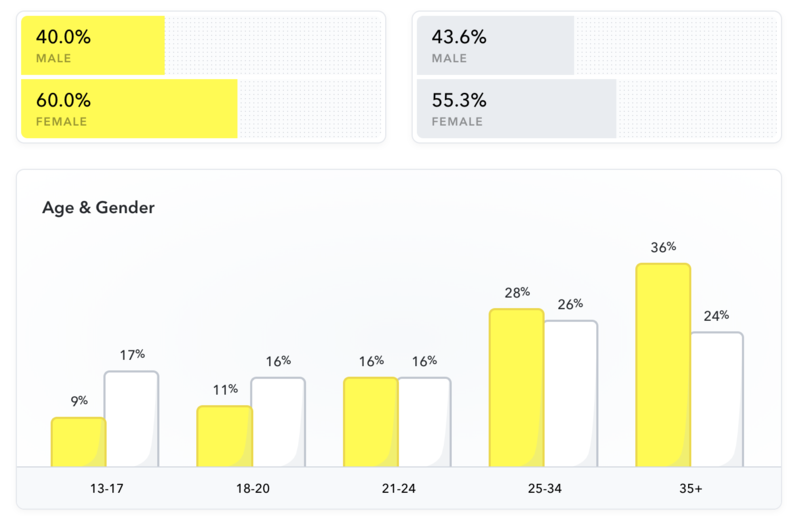 Finally, we have Snap’s Audience Insight tool. When targeting an audience with more than 1,000 users, Snap provides insights into identifying trends like demographics, locations, personal interests, and device breakdowns. This data has a myriad of uses! For example, upload a list of users that have completed IAPs within your app and find your paying demographics and adjust your budgets and bidding strategy accordingly. We just scratched a surface of what you can do using Tenjin and Snapchat! Stay tuned for more powerful growth marketing strategies.